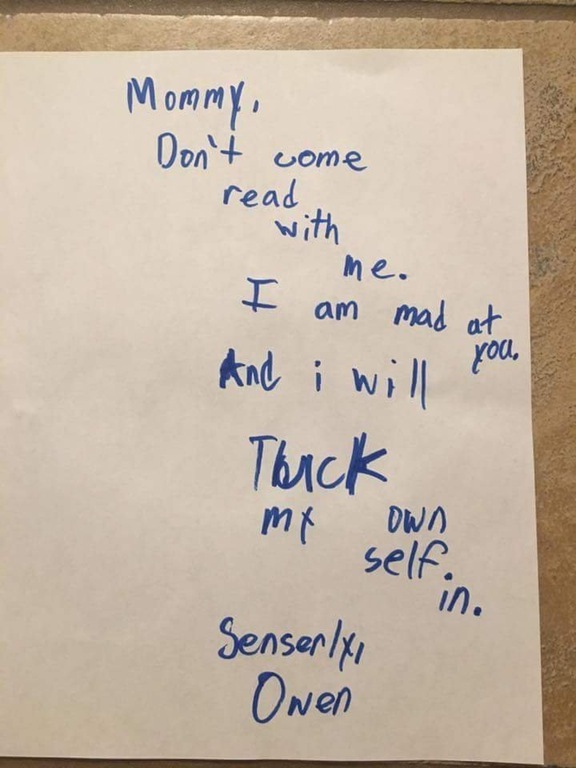 A little boy named Owen decided that space from his Mother was best, when he was "mad" at her. While it isn't clear just what Owen's mom did to deserve banishment from his room, it's obvious that she is going to have to do some work to win back his favour. The picture of the note, written on a plain white sheet of A4, was posted on Reddit by someone claiming to be the mother's cousin. "My cousin got her mommy privileges revoked for tonight," she wrote on the post. In four days, the post has received more than 1,200 comments, many of which are from other parents with similar stories of getting on their tiny tots' bad side. "I legitimately expect a note like this in my future. My preschooler punishes me when I've been a 'bad mummy' by putting himself to bed," explained one user. "Yesterday he was displeased with something so sat in the driveway and threatened to let strangers come and get him so I wouldn't get to have him anymore." Another added: "I once saw a note from my daughter (She was about 5 at the time) that read 'Don't come in. I hate everyone. Especially Dad!' I asked her the next morning and she couldn't remember why she was mad. Especially with me."